Mildred Dunlap has always been too tall, overweight and heavy featured, she has resigned herself to being an old maid. The daughter of the richest man in the area has set her up for ridicule and gossip. But Mildred’s spirit is indomitable. She remains kind and steadfast. Edra is Midlred’s cousin and best friend. A traumatic even when she was a child, has left her frightened and vulnerable. Mildred helped her move beyond the trauma and the two fell in love. Living in a small Western town, the two keep their relationship a secret. The arrest of Oscar Wilde in England, for gross indecency, makes them both afraid. What if they are found out? What will happen to them? Mildred comes up with a plan to cover their tracks by starting a relationship with the recently widowed Charley. She hopes a relationship with him will deflect notice from her relationship with Edra. Charley is a kind, handsome, friendly man who nursed his wife as she died of cancer. Devastated by her death, he is very much in need of a friend. Mildred shows him kindness and friendship. He is a loving, kind man who cherishes his friends and family. I have to admit, I completely fell in love with Charley. His sweet nature and warm, friendly spirit filled me with joy. 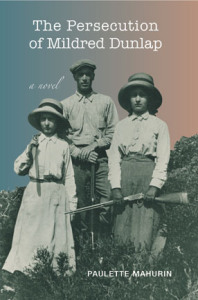 The persecution of Mildred Dunlap is a tender story of love, friendship, gossip and betrayal. Even in the adverse circumstances, the main characters remain steadfast. Paulette Mahurin’s characters are well developed and defined. Each has a distinctive personality that conveys itself to the reader. No one character dominates the storyline – they all share the stage, presenting different sides of the issue. Set in turn of the century Nevada, the author has beautifully laid the scene, capturing the spirit of the times and the small town dynamic. It is a fitting backdrop for the events which follow. The Persecution of Mildred Dunlap is a stunning book, appropriate for high school readers and older. In easy to digest terms, Paulette weaves a tapestry of Mildred’s life, laying her soul bare. She tenderly examines Mildred’s motivations as well as those of her enemy, town gossip – Josie. I really enjoyed the Persecution of Mildred Dunlap. It was an excellent representation of true love. It’s an honor to receive this from a sister author, whose work I really love. Thank you so much, Dellani Oakes. I’m very grateful for this.